The City of Prince Albert is located in central Saskatchewan along the banks of the North Saskatchewan river. With a population of approximately 35,000, Prince Albert is the third largest City in the province behind Regina and Saskatoon. With a rich historical culture, Prince Albert is home to some local cultural hubs including Memorial Square, the Prince Albert Historical Museum and the EA Rawlinson Centre for the Arts. In the Summer of 2018, Prince Albert set out to complete a wayfinding project for the downtown core. 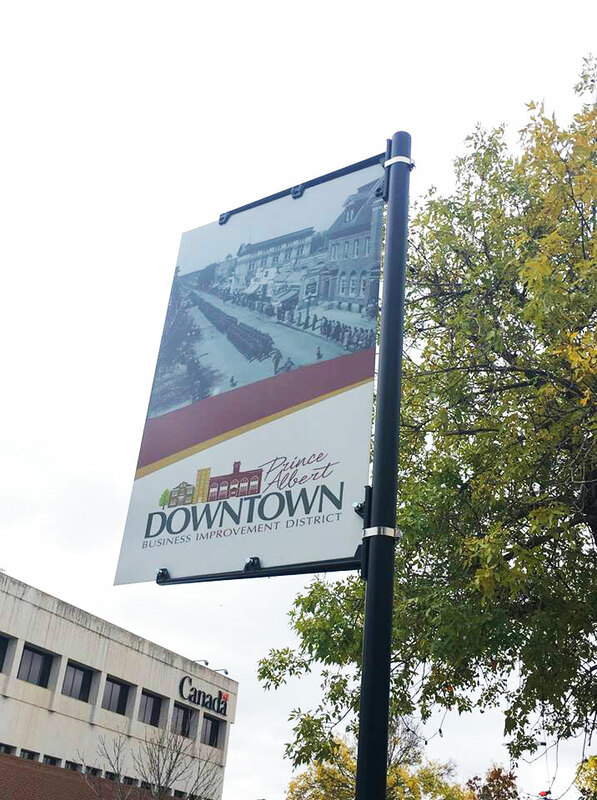 As part of a larger investment in to the revitalization of the downtown area, new wayfinding signs were a key factor in breathing life and historical elements back into the City centre. The Prince Albert Downtown is considered a historical, cultural and economic hub. The intention behind new wayfinding signage was two-fold. The first was to promote the downtown and the cultural elements it has to offer. The second was to provide functional wayfinding to the cultural facilities that also happen to be some of the main tourist attractions, including the Historical Museum, EA Rawlinson Centre for the Arts and the Mann Art Gallery. Prince Albert wanted to include historically significant imagery and downtown branding, as the city centre is filled with original buildings. The Prince Albert Historical Society was involved in the design phase to find images of buildings and landscapes from historical downtown. The downtown branding was used to promote recognizable imagery that represents the neighbourhood and gives visitors and residents a sense they have arrived at a distinct neighbourhood in the City. Every city or town wants to put their best foot forward, and that is precisely what Prince Albert set out to do. Their goal was to create wayfinding signage for the downtown core to help point visitors and residents to cultural facilities and incorporate local history to represent the City’s branding and create a strong sense of place. With only a preliminary concept in mind, Prince Albert was seeking an experienced project partner to provide consultation and execution. This included advising on final design, appropriate materials and logical sign placement. That’s where ATS Traffic came in. There is significant evidence to suggest that effective wayfinding programs have both quantifiable and perceived benefits for municipalities. This includes enhancing visitor experience, increasing transport efficiency, business viability and walk-ability. In some studies, for example, the public reported a 30% reduction in a sense of feeling lost, with observed journey times reduced by 16%. No matter what the setting, wayfinding helps direct visitors in motion to their destinations. It’s a visitor’s first and last point of contact with multiple points throughout a public or natural space. It also helps shape their opinion of your brand, business or region. Our goal with the City of Prince Albert was to help them achieve a historical look and feel, while creating user friendly signage to direct visitors and locals to key cultural locations. As a regular client of ATS Traffic, the City of Prince Albert reached out to us in their quest for a project partner. As the successful proponent for the project, we worked closely with their team to help create a successful wayfinding system in the downtown core. Knowing the importance of historical elements and branding, we worked with the Prince Albert team to ensure the look and feel represented their unique history. Key historic and cultural destinations are highlighted on the signs, directing visitors and locals alike to signature Prince Albert attractions. ATS Traffic manufactured and installed a total of 19 wayfinding signs for four main downtown access points: Central Avenue, River Street and 1st Avenue East and 1st Avenue West. There were also 12 signs created to be placed on main arterials through the City to point people to the downtown. The final product was well received locally, with significant local media coverage of the sign installation. In addition, the response from local businesses who were featured on the signs was overwhelmingly positive, as they were excited to see these wayfinding touch-points up around the downtown to attract visitors to their facilities. 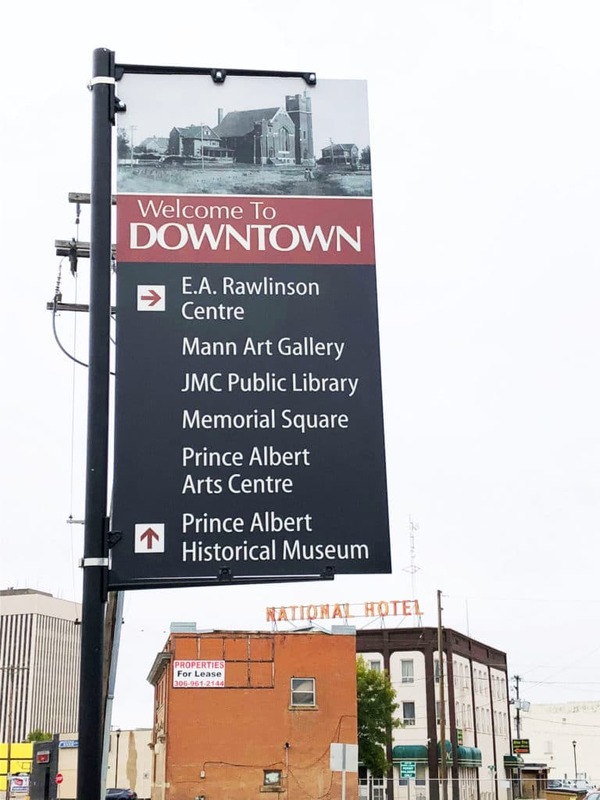 The Prince Albert Wayfinding project was part of a larger strategy to invest in the revitalization of the City’s downtown core, and the project only helped to further this initiative for the benefit of tourists and residents. Prince Albert is a great example of a community with a proud history who is connected to their roots, and who is committed to creating a rich experience for visitors and locals alike! “ATS Traffic helped us find creative wayfinding solutions. They were available to address any questions or concerns and were very clear on time lines involved. Having experienced and capable staff assigned to the project was key to our success! We are very happy with the final product and how well it corresponded with the original concept that was presented. We are also impressed with how well the signs present in terms of image quality and clarity.